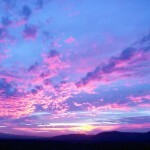 Question: I was in the Sierra Nevadas last week, and got up every morning at sunrise. The time of sunrise, according to my smart phone app, was way off — by nearly 30 minutes! In a mountainous area, how do they figure out the exact moment of sunrise and sunset? Is it based on an elevation of zero? Some of those hills are 14,000 feet tall. Answer: You are correct about mountains affecting the times of sunrise and sunset. Calculated sunrise and sunset times are based on the assumption that you have a clear view of the horizon, unobstructed by mountains, buildings, trees, etc. So if you lived in the Great Plains of the United States, or on a low island or peninsula with a view over the ocean, the predicted sunrise and sunset times would be far more accurate. The image above is from an informative website called TimeAndDate.com. I thank them for their generous permission to use that image. It shows the Earth on August 25, 1:00 am UTC. 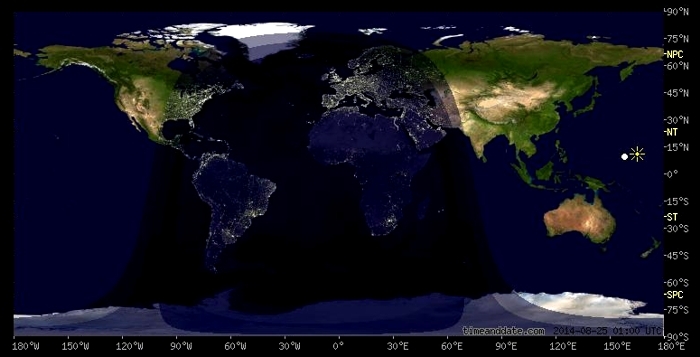 Dark areas are nighttime, light areas are daytime, the border between night and day is, of course, where sunrise (right edge) and sunset (left edge) are occurring on the planet. Interestingly, it accurately shows how areas near the North Pole are currently experiencing 24 hours of daylight, and near the South Pole, 24 hours of darkness. The Sun and Moon symbols mark the geocentric position of those objects (where they are directly overhead). In this modified Mercator projection, areas near the poles are distorted in size and shape. TimeAndDate.com also includes a handy calculator for the times of sunrise and sunset on any date for any location on the planet. As with their Day and Night Map, that calculator assumes a flat and unobstructed horizon. They also assume the observer is at the same elevation (measured from sea level) as the horizon. If you were observing from the top of a tall mountain, sunrise would happen slightly earlier, and sunset slightly later. But it would be a small correction — only about 6 minutes if observing from the top of Mt. Everest. The correction factor is: ΔT = ±1 minute per 1.5 km elevation. Another source of error is your specific location within your time zone. All locations within a given time zone have the same clock time, but locations near the east and west edges of the zone will experience differences in sunrise and sunset times of approximately 7 minutes (early in the east, and late in the west). 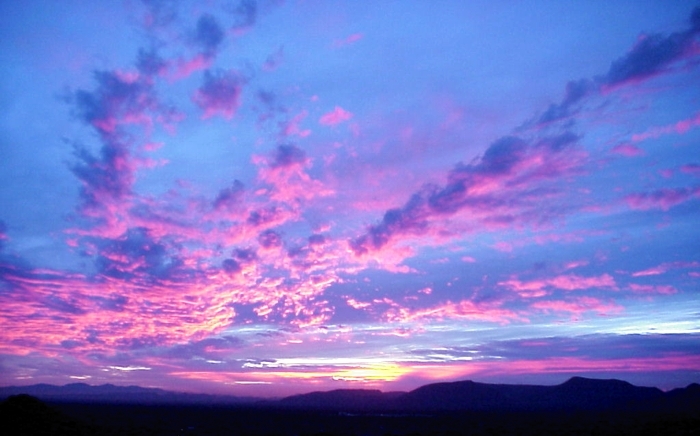 Further, there is an atmospheric refraction effect that delays sunset (and hastens sunrise) by about 2 minutes. This effect is only approximately predictable, as it depends on air temperature, density, and pressure along the light path. Mountains on your horizon will usually generate the largest errors. The Sun moves through the sky at a rate of 15°/hour. Say you have a large mountain on your horizon that is elevated 10° above the horizon. A quick calculation shows that mountain will delay sunrise (or hasten sunset) by: 10° ÷ 15°/hour = 0.67 hour = 40 minutes. I have a mountain just east of my property. Gavilan Peak has an elevation of 18° above my local horizon. 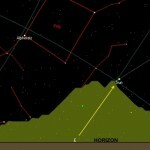 When the Sun rises around an Equinox near azimuth 90° (East), its approximately diagonal path behind the mountain is 22° in length. The sunrise delay is 1 hour 27 minutes under these conditions. Click on the thumbnail below to see the geometry. So the answer to your question is: Expect a difference between predicted and actual sunrise and sunset times. When you observe from the same location, you can learn to make the right topographic adjustments and probably nail the times of sunrise and sunset to within a few minutes. If, on the other hand, you observe from the bottom of a deep valley like the Grand Canyon, your “day” will be very brief if defined by the appearance and disappearance of the Sun. Of course, until the “real” sunset, there will still be much usable light scattered downward from the blue sky above. Been there, seen it, done that. Lest I leave you with the impression that I only see sunsets through a reductionist filter, allow me to share this beautiful image of an Arizona sunset. Click on the thumbnail to enlarge.